AARHUS, Denmark — The memory clung to him like a nagging hamstring injury. Despite all he’s accomplished the last two years — a World Championship silver medal on the track, two Commonwealth Games titles, a world record on the roads over 15 kilometers — Joshua Cheptegei could not escape what happened to him two years ago in Kampala, the lowest moment of his running career playing out in excruciating slow motion in front of thousands of his clamoring countrymen. No matter where he went, no matter how fast he ran, the questions would inevitably circle back to that day at the 2017 World Cross Country Championships, when Cheptegei’s body shut down with just half a mile remaining, transforming what would have been a historic victory into tragedy. Even if he wanted to, no one else would let Joshua Cheptegei forget that day. Maybe they will now. Because if Kampala 2017 represented the nadir of Cheptegei’s career, then his performance at the 2019 World Cross Country Championships at the Moesgaard Museum was his finest hour, and a memory worth preserving. 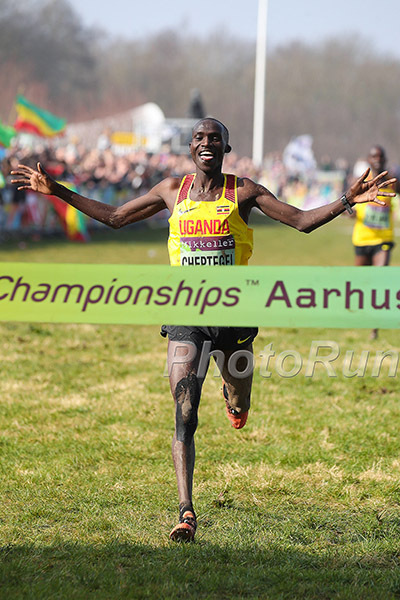 Cheptegei was magnificent in overcoming a star-studded field that included two-time defending champion Geoffrey Kamworor and his Ugandan rival and world junior XC champ Jacob Kiplimo, as well as a hilly beast of a course that many consider to be the toughest to ever host these championships. If there was a feature that could have broke Cheptegei’s body on the final lap, as the heat and humidity broke him two years ago, it was the monstrous 125-meter climb up the roof of the Moesgaard Museum — packed to the brim with spectators — at the end of each two-kilometer lap. Instead, it was where he sealed his triumph, breaking Kiplimo on the final lap and pulling away for good. Only then, once he had conquered his rivals and the course, did Cheptegei allow himself a chance to celebrate, peeking over his shoulder to confirm his insurmountable lead before a smile began stretching across his face, and finally, definitively, putting the heartbreak of Kampala behind him. He crossed the finish line in 31:40 for the 10,240-meter course to seal Uganda’s first senior gold medal at World XC. That victory grew even sweeter when countryman Kiplimo crossed four seconds later in second to lead Uganda to its first team title — the first time it went to a country other than Ethiopia or Kenya since 1980. 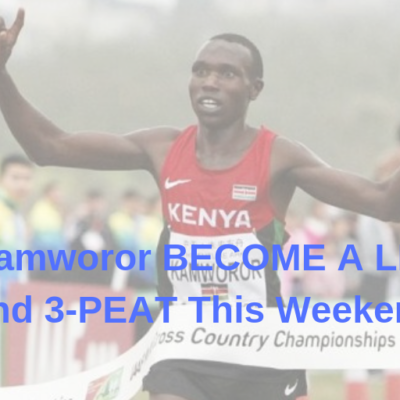 Kamworor, tenacious as always, gave a champion’s effort but today that was only good enough for third. 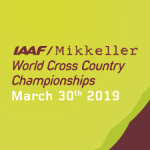 After a tentative first two laps, the race got going on lap three as Kiplimo pushed the pace, stringing out the field until a pack of five men remained up front: Kiplimo, Cheptegei, Kamworor, Aron Kifle of Eritrea (5th at ’17 World XC), and young Kenyan star Rhonex Kipruto. That group would begin to splinter on lap four as Kiplimo continued to attack, with Kipruto and then Kifle dropping back. In fact, Kiplimo began to open up a gap on Cheptegei and Kamworor as well, only for them to rejoin him shortly into the fifth and final lap. As the course crossed over from the museum’s west to east side, Cheptegei, who had held back throughout the race, began to ramp things up, and he built a small lead heading up the final ascent of the museum roof. He would only stretch it from there, opening up his stride as he descended the roof and made the two quick U-turns to the finish. Behind Cheptegei and Kiplimo’s 1-2 finish, Uganda ran away with the team title, scoring 20 points to 43 for Kenya (silver) and 46 for Ethiopia (bronze). 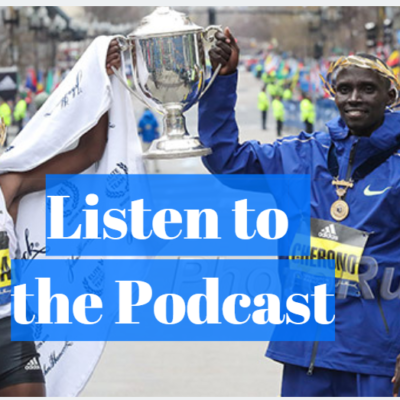 The United States had an awful day, finishing 11th overall, with Shadrack Kipchirchir (34th in 33:46) outkicking Stanley Kebenei (35th in 33:47) to finish as the top American. Kebenei was the only one to go out aggressively, running in 10th after one lap, but he slid back every subsequent split, from 27th after two laps, 29th after three, and 33rd after four. No other American was in the top 25 at any of the splits. While we hyped up the difficulty of the course ahead of the race, it didn’t seem to affect the best of the best. Heading into the race, we thought five men had a chance at winning, and those men took five of the top six spots, with Eritrea’s Aron Kifle, the 5th-placer from two years ago, taking the other. With that said, Cheptegei was about as prepared for this race as anyone could have been as he was one of the few athletes in the world who had actually seen the course before this week. Danish athlete Anna-Emilie Møller, who surprised with a 15th place in the women’s race, said she had never seen the course until yesterday. Cheptegei was in Europe in November and smartly came and visited the course, so he knew what he was in for climbing the roof. The area Cheptegei trains in in eastern Uganda is naturally very hilly, but after seeing the course, Cheptegei put an emphasis on training for the hills. He said that the hills he has been training on in practice were similar to the ones he faced in the race today. And Cheptegei ran those hills a lot — twice a week while Ruiter was over there. His final session, was incredible: an 8k tempo run, uphill for the first half and downhill for the second, running the first 4k in 14:00 and the second in 10:20 (4:09 mile pace — even downhill, that is flying). Interestingly, Cheptegei said that he believes he was in better shape at World XC in 2017 than he was today. Remember, Cheptegei missed the entire 2018 track season with a knee injury and missed more training time this winter after he was involved in a car accident at Christmastime. With a loaded roster, Team USA came into the meet rightly hoping to earn a team medal. In hindsight, a medal would have been a tall order. With Uganda running so well and winning gold with 20 points, Team USA would have had to score fewer points than they did in 2013 when they took silver with 52 as Ethiopia nabbed the bronze today with 48. That being said, 11th place and team scorers of 34, 35, 60 and 69 was far from what the US was hoping for. The US men hadn’t finished outside of the top 10 at World XC since 2007 when they were 11th. The last time the US was worse than 11th was 2006, when they were 12th. Heck, Great Britain sent what essentially amounted to a team of no-names and even they beat the US. GB’s top man was Patrick Dever, who owns PRs of 3:44/8:00/13:59. Their #2 was Mahamed Mahamed (8:13/13:55/29:21) and their third man is Adam Hickey, a full-time firefighter who hadn’t represented GB since 2015 (his last World XC was in 2007 as a junior). That squad has no business beating a US squad featuring a pair of 27-low 10k guys, an 8:08 steepler, and an 8:11 steepler. This was a day to forget for the Americans. 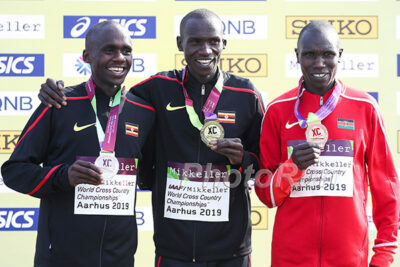 Both Shadrack Kipchirchir and Stanley Kebenei, the US’s top two finishers, said that the hills made it incredibly difficult to remain focused. And it’s not like the US went out incredibly aggressively. 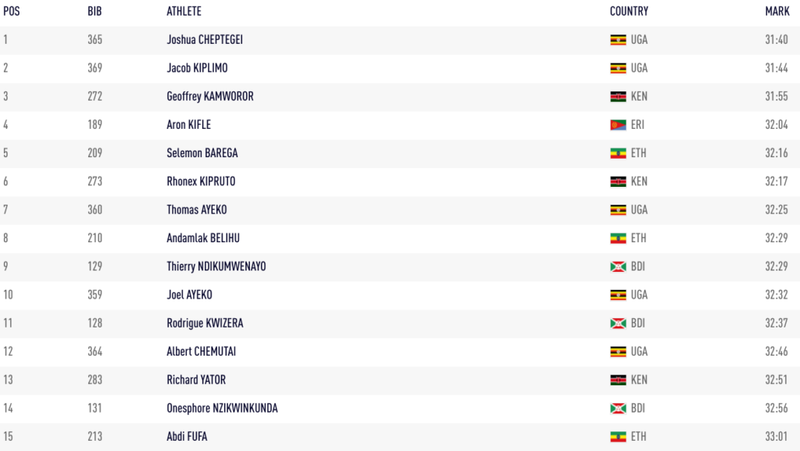 Yes, they were mostly moving backwards throughout the race, but aside from Kebenei (10th), none of them were higher than you’d expect them to be at 2k: Kipchirchir was 28th, Hillary Bor was 39th, and no other American was in the top 40. They didn’t go out too hard; they just didn’t handle the hills well, period. When you start conservatively and have a bad day on top of that, you get the disaster that was today’s performance. Spain’s Ouassim Oumaiz gave himself a hell of a 20th birthday present as he was the first non-African-born runner to finish today in 20th. A pretty incredible result for someone who has pbs of just 3:44.52, 8:12.15 and 14:56.15. Oumaiz was born in Nerja, Spain on the southern coast. As the crow flies, the town is only 102 miles from Morocco. The only other non-African-born runner in the top 30 was 27-year-old Aussie Brett Robinson, who was 30th. Robinson has pbs of 3:38, 7:45, and 13:15. We’ve always said the best thing about LetsRun.com is you — the visitor. The passionate fans that come to our site are often times are very knowledgeable. One unregistered LRC messageboard poster took a look at the elevation profile of the course, and then predicted a winning time of 31:39. The winning time ended up being 31:40. “The hill guru……” explained the logic behind their calculation. Taking historical data from previous world XC races, I used 28:35 as a winning time on a “flat” track. Estimating the hills gave me a total elevation gain of a little over 900 ft or 150 a mile. This works out to 3% incline. The cost of that is 37 seconds per mile. The accepted gain for the down hill is half or 18 seconds. This would make the course 19 seconds per mile slower, but with the amount of turns and mud/obstacles, I added in a buffer. The end result was that this course was 22 seconds per mile slower than a course that was mostly flat….The hill calculator I use is pretty accurate. Pretty amazing assuming her or she also knew the course wasn’t exactly 10,000 meters (it was 10,240 meters). 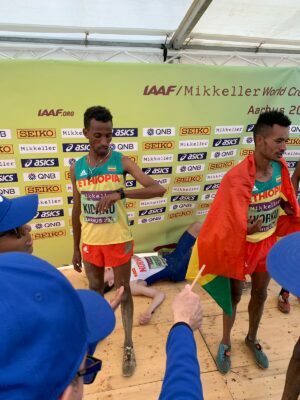 Ethiopia went 1-2 in the men’s junior race, with Milkesha Mengesha (5th in the 2018 African junior XC champs, 13:56 pb) winning the 8k event in 23:52 with Tadesa Worku (14:01 pb) in second. Forty-five seconds (and 10 places) back of Worku was the top non-African finisher, Norway’s Jakob Ingebrigtsen, who looked like a very tired man by the end of the race. Ingebrigtsen, who gamely ran with the lead pack for the first two laps before he began to fall off on lap three, looked spent climbing the museum roof for the final time. 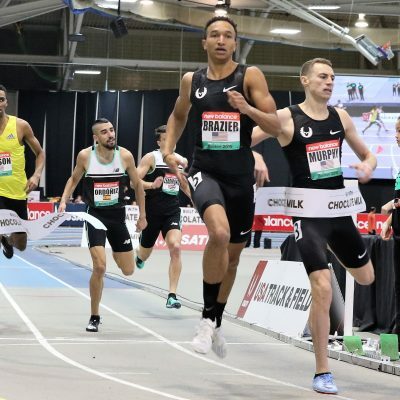 Usually so smooth and full of run on the track, the European indoor 1500 champion had no kick to speak of down the home straight, the fight drained from him by the grueling Aarhus course. He did hold on for 12th, but lay on the ground in exhaustion shortly after the race and had to be supported as he navigated the finish area. Ingebrigtsen did come through the mixed zone, but was in no state to conduct an interview. At one point, one of the people who had supporting him left Ingebrigtsen alone in the mixed zone, and he took that opportunity to sit — and, eventually, lie — on the ground as he was too tired to stand. Eventually, he received medical attention and was brought to his feet again and helped through the mixed zone. Though it wasn’t the result that Ingebrigtsen, a three-time Euro junior XC champ, wanted, we give him a ton of credit for suiting up and giving it a go today. He’s a 1500 specialist and already ran an indoor track season this year, earning Euro gold in the 3k and silver in the 1500. He could have easily skipped this race, especially considering he was the only athlete Norway entered in the entire meet. So props to Ingebrigtsen for being unafraid to take on the world’s best on a tough course — even if it’s not an event he’s totally suited for. The best result by an American team today belonged to the 4x2k mixed relay, which finished fourth and was almost upgraded to bronze. Silver medalists Morocco was initially DQ’d — for passing outside of the exchange zone — but appealed and was reinstated. 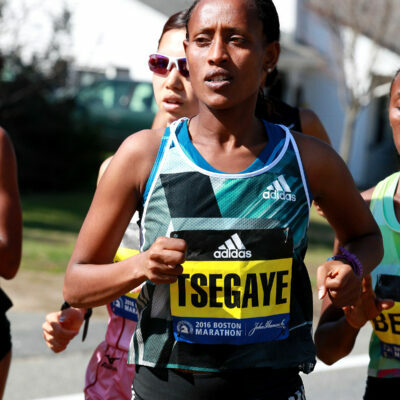 The Ethiopian squad of Kebede Endale, Bone Cheluke, Teddese Lemi, and Fantu Worku won the race, taking down a Kenyan team that featured world champions Conseslus Kipruto and Elijah Manangoi. Kenya had to settle for bronze as Morocco’s Rababe Arafi ran down Kenyan anchor Winfred Mbithe on the final lap. Kirubel Erassa ran a great first leg for the US, handing off in 3rd. To show just how hard this course is, he said he clocked the first mile on his GPS and it was only a 4:29 (he was only running 2k). Shannon Osika went out really hard, running a great first half of her leg, before fading on the difficult course and the US slipped out of the medals. The US’s third leg, Jordan Mann, although not quite as happy as when he finished 5th at USAs in the steeple last year, was still buzzing. “After the race — because I know you all want quotes — what I came up to say is, I saw [first leg] Kirubel [Erassa],” Mann said. “I said, I don’t know who Paul Chelimo is, I thought he was on this thing last year. Well, more accurately, two dudes and two dudettes. But yes, a solid run from the Americans. 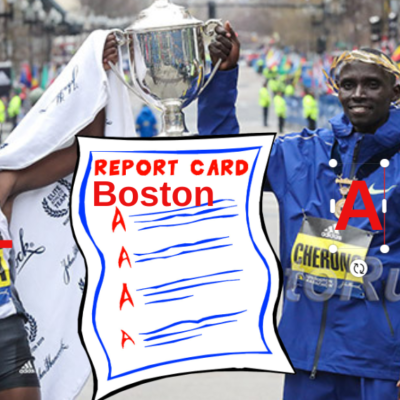 (And to be clear, Mann knows exactly who Chelimo is). You can never have too much Jordan Mann. We found him cheering on the men during the men’s race. 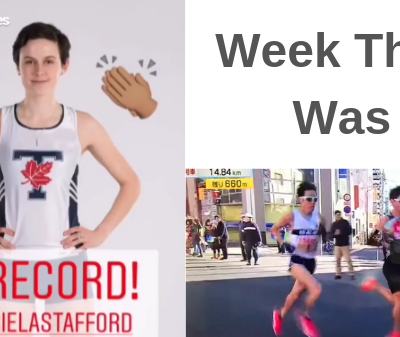 MB: Should the US give back it’s Mixed Relay bronze medal at World XC since it only got it because of this DQ (video)? Our motto may be “Where Your Dreams Become Reality,” but that doesn’t mean you always get the running result you want. 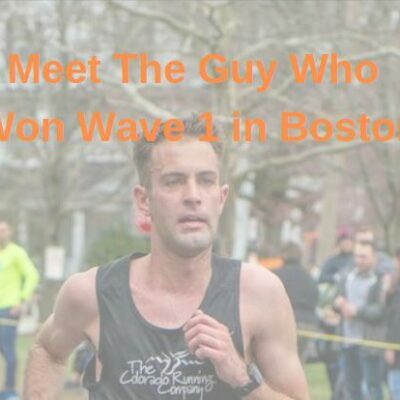 Matt Crowe was selected to run the senior race and represent LetsRun.com and he has a very cool backstory. His run today however did not go as he wanted and the officials pulled him from the course even though he was beating some of the “official” athletes in the race who were representing countries. The race had certain time checks along the course and you had to be within so many minutes of the leaders and Matt fell behind them. More: Women’s Recap: LRCWon and Done: Hellen Obiri Wins Her First (And Last) World Cross Country Title.